For several years I have been taking pictures of the ocean, especially the Pacific, crashing on the shore. As a wee girl my elderly father would take me to the beach after school, even on foggy, stormy days. I have since loved those deserted beaches and the powerful waves thundering as they reach the cliffs and land. 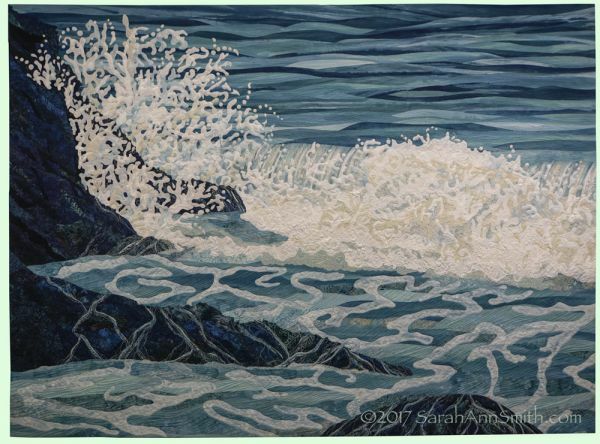 I dyed the fabrics for the distant and near ocean, and used commercial batiks as well as my hand-dyeds for the cliffs and breaking waves. Made for Quilts Inc. to use to promote the exhibit Sapphire Celebration, which will celebrate the International Quilt Festival's 45th Anniversary. Check here and scroll down for more information. Size: 59" tall by 80" wide. This quilt will be for sale in about three years. Price: $9900.